It’s no secret in the world of Safety that falls are one of the major causes of fatal injuries in the workplace and the number one killer in construction. A fact that flies a little more under the radar is that in the past decade 43% of all fall fatalities have involved a ladder. Yet, tell an employee you’re going to train them on how to use a ladder and you’ll most likely be subject to looks of incredulity. Training? On ladders? You put it up, you climb it, you climb down. I’ve been using them since I was 5 years old to get to my tree house. What could you possibly have to teach me? Of course, because they know that you are the safety manager (or whatever your title may be), they may not say that to your face, but you’d better believe they’re thinking it. In reality, ladders are very simple devices that should always be used properly, but they’re not. If they were, the statistic above wouldn’t be nearly that large. The truth is that in the vast majority of situations I’ve seen, ladders are used improperly. Whether they’re at the wrong angle, not secured, not set up on a firm, level surface, not tall enough, broken apart, lashed together, a closed A-frame, or any other number of issues, they’re wrong. Ladders are misused so often that some major construction companies have all but banned them in situations where lifts or scaffolds can be used instead. So how do you stabilize a ladder? One of the biggest misconceptions of ladder instability is that you’re protecting against the ladder falling back on you (see any movie ever made where somebody falls off a ladder) when in reality the biggest hazard is lateral movement. 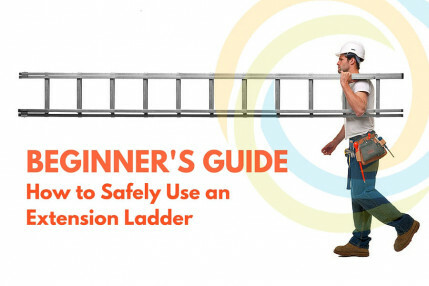 In order to properly secure and stabilize your ladder, you need to begin from the bottom up. First, your ladder needs to be in proper working condition. A quick inspection should determine that the ladder is in the condition in which the manufacturer intended it to be used. If there are two sections to the ladder, both sections should be in place. Rungs should all be unbent and unbroken. The ladder should be free of oil, grease, or any other substance that could cause you to slip. Ladder falls don’t occur only when the ladder itself falls – plenty of people fall from the ladder! Safety feet should be in place and in good condition. Where are you setting up your ladder? The answer should be “on a firm, level surface*”, but that’s often not the case. Ladders get set up in mud puddles, mulch beds, or areas that have recently been dug up. 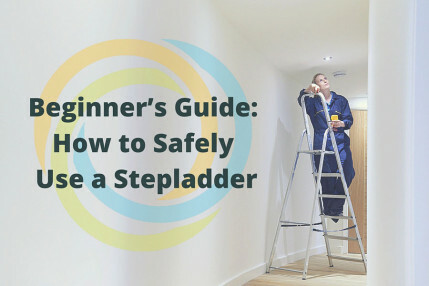 Other times, ladders get set up on smooth surfaces like waxed floors and don’t have safety feet in proper working condition to keep them from slipping out from under the worker. If you’re not going to set up your ladder on a firm, level surface, you shouldn’t set up your ladder, period. This does not mean that you should grab a couple of cinder blocks and throw them in the mud to build a base, because, while this may be firm and level, it is not stable. So, let’s say you’ve found the perfect place – firm, level, AND stable (and the safety feet are in place). You’ve set the ladder at the proper 4:1 ratio (if it’s a straight/extension ladder, otherwise you’ve fully opened and locked you’re a-frame). You’re good to go, right? Well, that depends (and isn’t that always the case?). Your next step is to look at what’s around the base of your ladder. Is there debris, material, tools, hoses, cords, or anything else that could pose a tripping hazard? Cluttered ground is dangerous enough when approaching the ladder to climb, but even more so for someone climbing down off the ladder. Remember, they’re backing down and may not be looking at the ground as they should be doing. Any objects at the bottom can potentially cause a dangerous trip and fall. Now that you’re on a firm, level, stable surface with safety feet intact and a clear area around your base, we skip all the way to the top. If you’re going to have lateral movement of the ladder that causes you to fall, it’s not going to come from you being at the bottom and it probably won’t come from you being at the middle. Most likely it will occur while you are toward the top. So, how do we make sure this doesn’t happen? Even with the perfect surface, your weight and motion could cause something to go wrong (and we’re assuming you haven’t even overloaded yourself with tools, causing you to exceed the ladder’s limits). There are a few things that could help, the most important of which is required every time you set a ladder: secure the top. This should not be done using the ladder’s own lanyard. This should not be done by tying something to the bottom or middle of the ladder. This needs to be done by securing the top of the ladder to the structure up which you are climbing by tying it to something sturdy with rope or wire, using attached hooks, or through some other means. Assuming this is done well, the ladder should not move at all. However, it is not always possible to find something to which to secure your ladder. In these situations, you want to utilize a ladder stabilizer. This device attaches to the top of your ladder making the area where the ladder contacts the structure much wider, and therefore much more stable. One final thought about the top. Many ladder accidents occur as a worker at the higher level tries to mount the ladder for descent. The ladder can kick out, shift laterally, or the worker can simply lose their footing or balance as they try to get around the side-rails. It is easy to reduce this exposure with a simple ladder extension. This product allows the worker to step straight through the ladder side-rails while still giving the necessary 3’ of height to be compliant with OSHA and allow for a good handhold while mounting and dismounting. Everywhere I have implemented these, the workers love it. Remember, even though we’ve all been using ladders since we were kids, they are not toys. If you knew ladders only by statistics, you’d think of them as highly dangerous tools that come with great risk to the user. Don’t become part of those statistics, treat ladder setup with the respect it deserves. 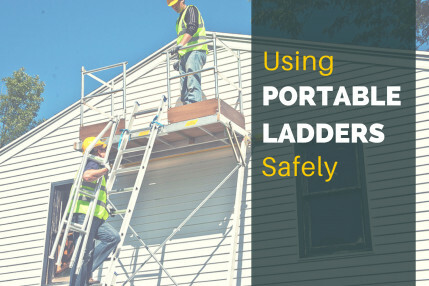 Whether you’re a plumber, painter, electrician, maintenance worker or any other number of trade professionals, the portable ladder is a go-to solution for difficult-to-reach work tasks. 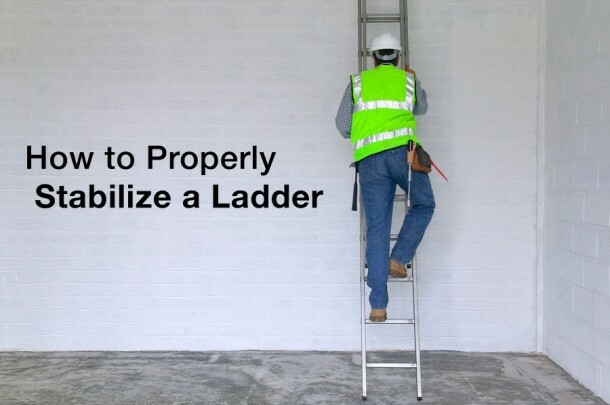 Therefore, it is important workers know how to properly and safely use portable ladders.